Gift noun – a thing given willingly to someone without payment; a present. It turns out that the giver has only apparently lost. Not only does he have the power over the recipient that the gift has bestowed on him, but the recipient is obligated to nullify that power by repaying the gift. The rivalry even entails the return of a greater gift: In order to get even the giver must not only redeem himself, but he must also impose the “power of the gift” on his rival in turn. In a sense the presents are repaid with interest. Thus the gift is the opposite of what it seems to be: To give is obviously to lose, but the loss apparently brings a profit to the one who sustains it. 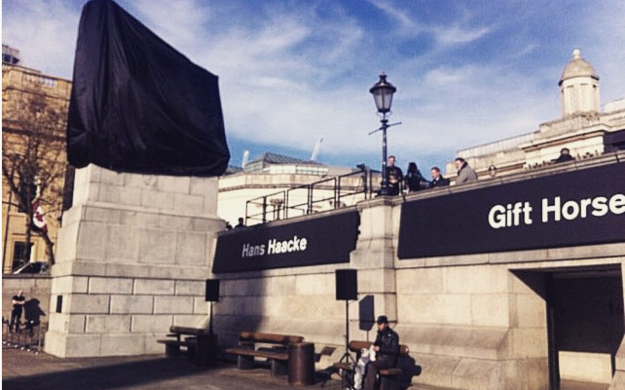 To state ‘never look a gift horse in the mouth’ might seem like an obvious and trite way to start a discussion of Hans Haacke’s recent Fourth Plinth commission, but there is definitely something in the old saying. Far from being long in the tooth (sorry), it demonstrates a sentiment which has run from protohistoric civilizations to the internet age of courtesy Facebook likes and Twitter favourites: that a gift must never be taken for granted; that it has its own imbued meanings; and therefore to squander that gift, or refuse it outright, would be seen as disrespectful because, after all, it does have a value. I was always taught to say thank you and I would hope that you were too, but when it comes to a gift how is one to reciprocate? The history of destruction as impetus behind modern art has been well documented and the chronology runs pretty smoothly and without much objection: Marinetti’s 1909 call to burn the museums; Gustav Metzger’s first Destructivist manifesto of 1959; Jean Tinguely’s Homage to New York (1960) at MoMA; the Destruction in Art Symposium of 1966; Pete Townsend – famously, a student under Metzger at Ealing Art College – smashing his guitars on stage; Hendrix and his sacrificial instruments in flames; Richard Hell, and later Vivienne Westwood, ripping open garments; and Michael Landy’s repeated spectacles of modern consumerist critiques in the twenty-first century. All these occurrences, with their political stances from pro-war rallies through late ‘60s counter cultures and punkish anarchism, have been seen as radical, against the grain of the modern. Decidedly anti-twentieth-century. The will to lose, to prodigally waste your lot, is to be counterproductive in the consumerist society in which we live. Therefore, one can assume that productivity can be defined as consumption toward an end. We consume in order to produce but we produce because we consume. It is within this cyclical paradox that one disguised and ancient phenomena of destruction has remained to fuel the wallets and souls of civilians right into the heart of post-Fordism: The Gift. We give, Marcel Mauss claimed in his essay The Gift (1925), in order to receive in return. A supposedly voluntary and free gift is the most basic form of contract between two groups of people, after all it is a social, and not a personal, construct that we are dealing with. It is so fundamental to our society and basic in its formulation to the point that is never written down or stated, yet everyone knows the score: everyone is at negative 1. It is the gift which can be traced as the source of modern commerce, not the barter, as many people believe. So Haacke has given us something. We have had a gift bestowed upon us which is lovingly wrapped with a bow; and as united Londoners and we have accepted it. What do we give in return? How does a public gift, comparable to the potlatch of the North Americans and Spanish kings, warrant its return? In bygone years it was always with interest. Rivals would pass gifts to each other in order to show their superiority – this is called ‘the power of the gift’. “Look what I can afford to lose” one gift says. “Well I can give away more than you so I am more powerful” says the next. Repeat until funds have depleted and the only sacrifice one can make is oneself. Suicide in art is another theme which has a history running through the veins of modern art, but that is another tale to tell altogether. Gift Horse, so the literature surrounding it states, passes comment on the links between money, power and history. A rider-less horse, harking back to the original statue of William IV planned for the site; based on an etching by Stubbs in front of the National Gallery in a public square – the home of politicised marches – topped off with a sarcastic bow around its front leg; ticker tape, live feed from the London stock exchange illuminates Trafalgar Square in LEDs, juxtaposed with the traditional blackened bronze of the skeleton. The links between money, power and history are, superficially at least, easy to trace. But Haacke isn’t an artist who ventures after the superficial. Granted, the aesthetic is a key component of his work, but the what and the how are two startlingly different things. This is a man who doesn’t offer his followers artworks, he actively seeks out a very specific audience in order to tell them something they didn’t want to know or were unwilling to learn. Haacke says that “the context in which the public encounters [my] work…plays an important role”, adding “The people who came across my installations in public places…are different from the museum public”. Furthermore, “The social and political character of the exhibition locale plays a role” in how his artwork is consumed and understood (Bourdieu and Haacke, 1995: 90-91). So then, after that long-winded and meandering introduction we have come to the point where anarchic notions of gift exchange, rebel strands of inverted economies of loss and the historical backbones of the fourth plinth collide at the point at which we stand, staring up to the beast. We are the audience Haacke sought out, the “uninitiated passersby in the street” (ibid.). We are the holders of the accursed share with a debt to pay. This essay was originally published via Curating the Contemporary CtC. Read the full article here.